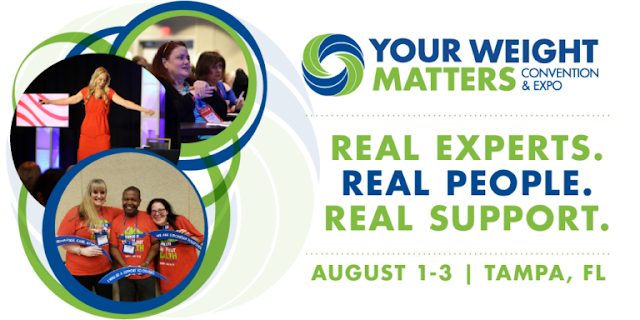 If you are searching for a great way to stay on track with your health and weight I highly recommend attending #YWM2019 the Your Weight Matters National Convention. Trust me on this... it will be a life-changing and awesome experience that will energize or reaffirm your commitment to your journey with weight. The education is of the highest caliber, the nation’s leading experts (the scientists putting out all the latest studies) break down all the confusing, conflicting messages (free of scams and BS) to give you practical knowledge you can take home. The Obesity Action Coalition hosts the convention each year and it floats around the country but where ever it is each year treat yourself and go. This year it's in Tampa, Florida which is actually the hometown of the Obesity Action Coalition so you can be sure it will be extra special. Science-based education presented experts in the field. Connections and support in a like-minded community of others. EXPO Hall with 30+ vendors offering products, services, samples! Fun special events and activities. We do a fun theme party each year. Learn about how to get involved or active in advocacy and #OACAction opportunities. View the 2019 Program Agenda. You will get that great education but even better it will inspire and motivate you for the year.